As air travel became more popular and the United States Army Air Forces established a base at the airport during World War II, a third runway was added ( Runway diagram for 1955). The April 1957 OAG (formerly the Official Airline Guide) shows 42 weekday departures: 18 on Western, 17 United and 7 Frontier. United had flown nonstop to Chicago since 1950, but a New York nonstop didn't start until 1968. The first jets were United 720s in September 1960. A new terminal was needed and work began on the west side of the airport on Terminal 1, designed by Brazier Montmorency Hayes & Talbot and dedicated in 1960 after seven years of work and a cost of $8 million. In 1968 the airport became Salt Lake City International Airport  when a non-stop route to Calgary, Canada was awarded to Western Airlines. During the 1980s the airport saw further expansion to both terminals as well as runway extension. In 1987 Western Airlines merged with Delta Air Lines. Salt Lake City would continue to be a major airline hub. In 2001, Concourse E was expanded for additional gates and SkyWest Airlines opened its new maintenance hangar and training facility. In 2002, the airport saw heavy crowds as Salt Lake City welcomed over one million visitors for the Winter Olympics. In June 2008, Delta Air Lines began daily nonstop service to Paris–Charles de Gaulle. This marked the first scheduled transatlantic route from Salt Lake City. In November 2008, Delta announced nonstop service to Narita International Airport near Tokyo, Japan, mostly as a result of Delta's merger with Northwest Airlines. The service began on June 3, 2009,  the first nonstop from Salt Lake City to Asia. Between 2010 and 2011, the flights to Tokyo were seasonal, May to October. Delta has not operated the flight since October 2011. In addition to runway reconfigurations, the airport will construct a new terminal and two new concourses. Plans call for a single terminal with an attached concourse consisting of 31 mainline gates and an additional parallel satellite concourse consisting of 15 mainline gates and 44 regional jet gates. The two concourses would be attached to an underground automated train. The existing terminal and concourses would be demolished and would leave room for additional expansion onto the two new concourses in the future. Other plans call for a new parking garage and expanded cargo facilities. As of March 2019 the new South Concourse, and Terminal are under construction. With the new airport structures visible. Due to the construction, The gates at Councourse E were demolished partly. Concourses G and F have been renamed from their former names of A and B as the new airport will have 2 two concourses named G and F. The structure of the new gateway is visible from terminal 2. The new parking garage is almost completed. And a new Truck stop with a Beans & Brews, and a Burger King has been constructed. The airport spans over 7,700 acres (3,116 ha) and has four runways. The runways are generally oriented in a NNW/SSE magnetic direction due to consistent prevailing winds in this direction. The flight status screens inside the International terminal. Terminal 1 has Concourse G (formerly Concourse A) and Concourse F (formerly Concourse B). Terminal 2 has Concourse C.
International Terminal has Concourse D and Concourse E.  Arriving international flights only use gates D2, D4, and D6 in Concourse D, however. The airport is accessible from I-80 at exit 115 B or from I-215 at exits 22 and 22 B. The airport can also be accessed from North Temple street and Utah State Route 154 (Bangerter Highway) both of which terminate and merge into the airport's Terminal Drive. Rail and bus services that connect the surrounding region to Salt Lake City International Airport include TRAX light rail, UTA Bus service and FrontRunner commuter rail (via TRAX). Ground transportation is available to ski resorts and locations throughout Salt Lake, Davis, Weber, Utah and Summit counties from Salt Lake International Airport. Many Salt Lake taxis, limousines and shuttles accommodate ski equipment. Despite being the twenty-eighth busiest airport in the world in terms of aircraft operations,  the airport still maintains a large general aviation presence. In 2008, 19% of aircraft movements at the airport came from general aviation traffic. This is in contrast to most large airports, which encourage general aviation aircraft to use smaller or less busy airports in order to prevent delays to commercial traffic. The airport is able to effectively handle both commercial and general aviation traffic largely in part to the airport's layout and airspace structure. Nearly all general aviation operations are conducted on the east side of the airport, away from commercial traffic. Additionally, smaller and relatively slower general aviation aircraft arrive and depart the airport in ways that generally do not hinder the normal flow of arriving or departing commercial aircraft. 2007 data shows there are 388 general aviation aircraft based at the airport. The airport has two Fixed-Base Operators, located on the east side of the airport. The airport has facilities for Air Ambulance, Law Enforcement, as well as state and federal government aircraft. Additionally, the airport is home to several flight training facilities, including one operated by Westminster College. The base occupies approximately 135 acres as a U.S. Government cantonment area leased from the airport. In addition to flight line, the installation comprises 63 buildings: 3 services, 13 administrative, and 47 industrial. There are 255 full-time Air Reserve Technician and Active Guard and Reserve personnel assigned, augmented by 1,343 part-time traditional air national guardsmen. The host wing for the installation is the 151st Air Refueling Wing (151 ARW), an Air Mobility Command (AMC)-gained unit operating the KC-135R Stratotanker. Delta jets parked at Concourse D in October 2011. On November 11, 1965, United Airlines Flight 227, operated with a Boeing 727, crashed just short of the runway at Salt Lake City International Airport (then named Salt Lake City Municipal Airport), killing 43 of the 91 people on board. On December 17, 1977, United Airlines Flight 2860, a cargo flight operated with a Douglas DC-8 crashed into a mountain near Kaysville while in a holding pattern prior to landing at Salt Lake City International Airport. The crew was trying to figure out an electrical problem, and did not realize they were adjacent to a mountain. All three people on board were killed in the accident. ^ "Stats summary" (PDF). slcairport.com. 2018. ^ "Air Traffic Statistics". Salt Lake City International Airport. January 2017. Retrieved February 24, 2017. ^ 2006 population estimates from the U.S. Census Bureau Retrieved on March 5, 2008. ^ "Utah Continuous Airport System Plan – Executive Summary". Utah Department of Transportation. Retrieved September 30, 2013. ^ "AIR TRAFFIC STATISTICS AND ACTIVITY REPORT" (PDF). Salt Lake City Department of Airports. Archived from the original (PDF) on April 14, 2015. Retrieved April 14, 2014. ^ "SLC Fast Facts". Salt Lake City Department of Airports. Retrieved February 2, 2018. ^ "Salt Lake City, UT: Salt Lake City International (SLC)". Bureau of Transportation Statistics, United States Department of Transportation. Retrieved January 24, 2011. ^ "Department of Airports 2008–2009 budget" (PDF). Salt Lake City Corporation. Archived from the original (PDF) on June 9, 2011. ^ "Curtiss Flies at Salt Lake". The New York Times. New York City. April 9, 1911. Retrieved March 4, 2008. ^ a b Wadley, Carma (December 4, 2003). "100 years of Flight". Deseret News. Salt Lake City: Deseret Digital Media. Retrieved March 4, 2008. ^ a b c "Airport History". Salt Lake City Department of Airports. Retrieved April 16, 2013. ^ Berryman, Marvin E. "A History of United Airlines". The United Airlines Historical Foundation. Retrieved April 16, 2013. ^ "J. Willard Marriott Digital Library". content.lib.utah.edu. ^ "Airport History". Salt Lake City International Airport. Retrieved January 29, 2014. ^ Mullins, Robert D.; Costanzo, Joe (August 12, 1977). "SL Airport Growing But How?". Deseret News. Retrieved June 16, 2012. ^ "Salt Lake City International Airport Commuter Terminal and International Arrivals Building". GPA ARCHITECTS, INC. Retrieved September 30, 2013. 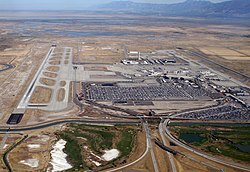 ^ "Walking path opens at Salt Lake airport". USA Today. The Associated Press. September 4, 2009. Retrieved April 16, 2013. ^ Hancock, Laura (June 4, 2009). "Delta begins nonstop flights between Tokyo, Salt Lake". Deseret News. Salt Lake City: Deseret Digital Media. Retrieved April 16, 2013. ^ Beebe, Paul (May 7, 2010). "Delta to resume SLC-to-Tokyo route". The Salt Lake Tribune. Salt Lake City: MediaNews Group. Archived from the original on October 4, 2013. Retrieved April 16, 2013. ^ Alberty, Erin (November 18, 2015). "Air France plane diverted to SLC after bomb threat is cleared to leave for Paris". The Salt Lake Tribune. Retrieved May 27, 2016. ^ "KLM to launch service to Salt Lake City (USA) and Ibiza (Spain)". December 15, 2015. Retrieved December 15, 2015. ^ "Salt Lake City International Airport: Airport Layout Plan Update" (PDF). HNTB Corporation. May 2006. Archived from the original (PDF) on February 11, 2014. Retrieved October 1, 2013. 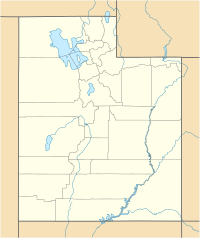 ^ "SLC airport expansion plan open to comment". The Salt Lake Tribune. Salt Lake City: MediaNews Group. June 18, 2010. Retrieved April 16, 2013. ^ Page, Jared (February 21, 2012). "Everything you wanted to know about the Salt Lake City International Airport expansion". Deseret News. Salt Lake City: Deseret Digital Media. Retrieved April 16, 2013. ^ Salt Lake City International Airport. "SLCA-Overview" (PDF). Archived from the original (PDF) on February 13, 2015. Retrieved April 23, 2015. ^ a b "2008 Salt Lake City International Airport Statistics" (PDF). Salt Lake City Department of Airports. Archived from the original (PDF) on March 4, 2009. Retrieved February 24, 2009. ^ "Utah Air National Guard Base renamed to honor 95-year-old hometown hero". Archived from the original on January 5, 2015. Retrieved January 21, 2015. ^ "View the Timetable". Retrieved February 26, 2017. ^ "Salt Lake City, UT: Salt Lake City International (SLC)". Bureau of Transportation Statistics, United States Department of Transportation. Retrieved January 30, 2019. ^ "U.S. International Passenger & Freight Statistics - CY 2016 Passengers". United States Department of Transportation. 2017. ^ U.S. Department of Transportation, Bureau of Transportation Statistics. Accessed January 9, 2017. ^ Marsh, Rene; Yan, Holly. "2 Air France flights from U.S. to Paris diverted because of bomb threats". CNN. Retrieved November 18, 2015.